Things get really interesting now. 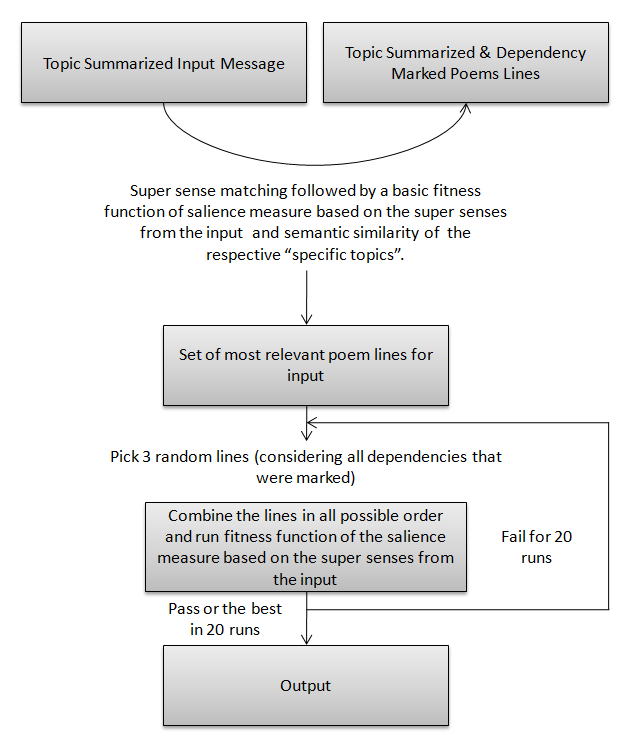 Now that we have our topic summarization algorithm ready, we shall try to understand how to figure out the poem remixing part. We search the poems database with the highest ranked salient measures of the input super senses and we shortlist an initial bunch of lines. 1. Is the same word (similarity value =3) or Part of the same synset or other similar relations (similarity value =2). Now we have a bunch of lines which are quite relevant to the poem. Here we randomly pick 3 lines (considering dependencies if any) and then we combine them in all possible ways and see which produces a higher salient measure based on the input. If the measure passes the fitness test we leave that as the final output. Else this process is repeated for 20 times and the best output is shown. The following is the overview of the proposed recombination algorithm.